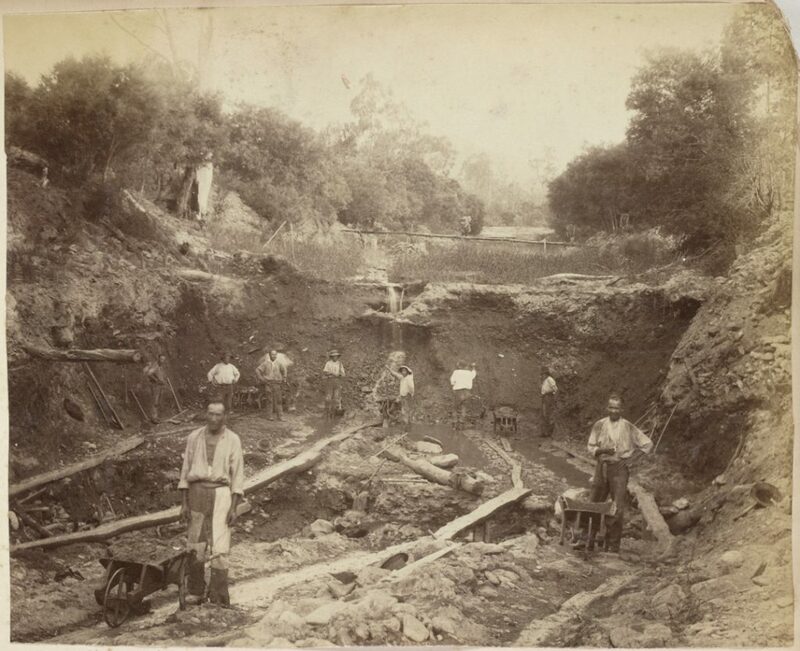 Following the discovery of gold in Victoria in 1850, large numbers of immigrants from China, Europe and America flocked to the goldfields chasing wealth and riches. For Chinese immigrants, the journey began in Canton or Hong Kong and included several months at sea before arriving in Victoria, or ‘New Gold Mountain’. Whether destined for Ballarat, Mt Alexander or the Bendigo goldfields, men disembarked in Geelong or Melbourne and began the laborious excursion to the goldfields. In 1855, the Victorian government introduced the Chinese Immigration Act, which imposed restrictions on Chinese passengers entering through the Victorian port. This legislation limited the entry to one person per ten tonnes of ship cargo, with a ten pound tax on every Chinese immigrant. Due to these restrictions imposed by the Act, many men disembarked in South Australia and travelled by land to the goldfields. An estimate of 17,000 Chinese immigrants took the journey from Robe to the goldfields on a track over 400kms in distance. 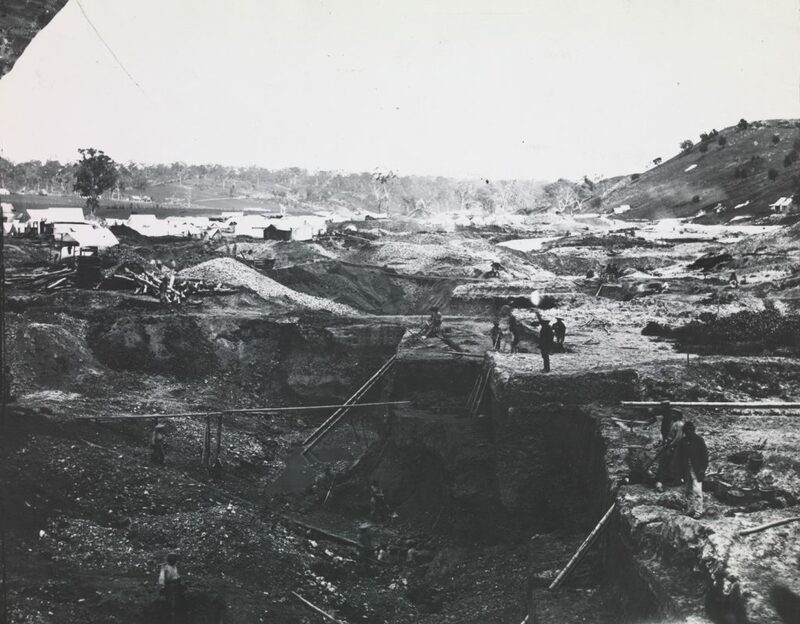 Almost all Chinese miners who arrived on the goldfields took up alluvial mining. This method involved extracting minerals by dredging alluvial deposits; that is, soils subjected to flooding or where a river once flowed. Lacking the capital required for quartz mining, they favoured alluvial mining due to the quicker returns to pay off accrued debts. 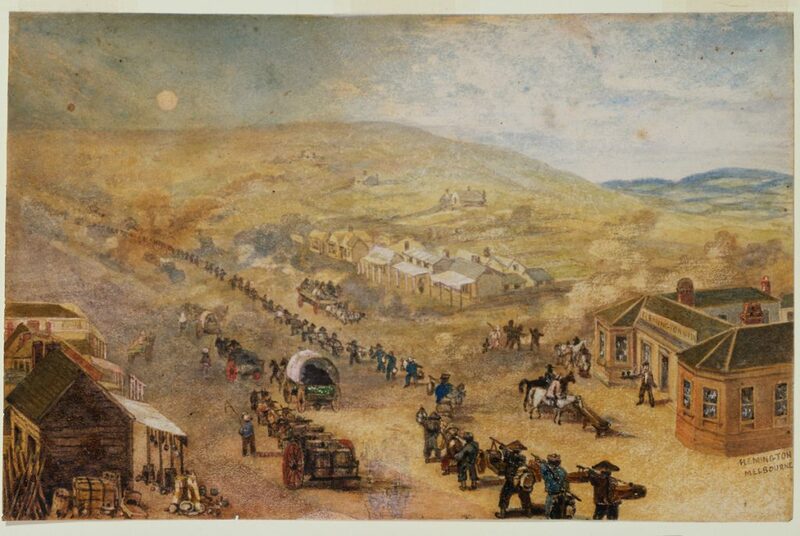 The influx of Chinese miners to Victoria from 1854 was felt across rural townships, with goldfield camps filling with aspiring alluvial miners. The camp in Guildford became known as Old Canton and was one of the largest during this period. Old Canton provided all necessary services and supplies to Chinese miners, including barbers, restaurants, letter-writers, opium shops and gambling houses. In all goldfield towns populated with large groups of Chinese immigrants, ‘Joss Houses’ were established for a place of worship, association or congregation. A European term, ‘Joss Houses’ were either ancestral temples for specific family groups or places of worship dedicated to specific deities. By 1859 there were over 40,000 Chinese migrants in Victoria, and an estimated equivalent of one in five of the male population on the goldfields. They were initially welcomed with curiosity, but their occupancy of goldfield sites, along with their religion, culture and language, contributed to developing discriminatory attitudes. With no understanding of Confucianism, Taoism or Buddhism, Europeans deemed the religions of the Chinese unacceptable in their new society. The Chinese Immigration Act introduced new laws to regulate and safeguard the immigrants through a ‘protectorate’ system, however many miners were still subjected to racial attacks and violent assault. Among the Chinese immigrants were skilled doctors, gardeners, artisans and business people who shaped Victoria’s cultural and economic development. As many Chinese settling on the outskirts of the city, market gardens were formed and serviced Melbourne’s fruit and vegetable markets. However, the presence of Chinese culture in regional Victorian towns both during and post the gold rush period remains to be felt amongst local communities. Discover this story and more in the Changing face of Victoria exhibition, open daily on Level 5 of the Dome Galleries, overlooking the La Trobe Reading Room.